Incipient of Google+ has set Facebook high on its never ending fire of continuous change. Facebook’s latest changes once again prove the level of brooding it has for the Numero Uno spot on the web. However, these alterations in privacy and other areas in Facebook are seen as an influence of the harbinger we call G+. Remember the epiphany of Weiner’s bared chest! That was the sheer case of privacy issues related to how does one share on social networks. And capitalizing on this same point, Google+ gained its charm/hype on. Yes, G+ bloomed on the most sensitive and hyped issue in social networking under its presentation CIRCLEs. And this is the first point, Facebook has quickly realized and learnt from Google+. Since the launch, the ‘circles’ meant for the extended level of privacy has been disseminating the beauty of Google+. And learning from the ‘circles’, Facebook has recently (on 22nd Aug, 2011) introduced its latest privacy changes in status updates, tagging and sharing. Now, one can share more powerfully by including the location and tagging people with the use of Inline Profile Control (as FB names it), meant for extended privacy. The inline profile control lets you mange the sharing option of who can see that post when you publish. The status update area now contains the icon to select the people you want to share that post with. The option ‘everyone’ is being changed to ‘public’ to make it more meaningful. With the introduction of ability to change the sharing option later (e.g. - you can change the visibility of a post from public to friends later), Facebook has left Google+ a step behind. Google+ though lets you edit, delete and lock your posts, yet it lacks the option to change the circles shared with. Now, Facebook photographs are much cleaner and bigger with the resolution of 720 X 960 pixels and a white background. Obviously, FB has learnt from Google+ that watching a photograph on a social network should be easier and relaxed. And as a result, now we can experience a bigger size, whiter background, centered placement and most importantly the ad-free photographs. Yes, Facebook learning from Google+ has discontinued its practice of ads in photos. With this move FB has shown a keen interest in keeping the user experience on priority above their earning, and that’s a welcomed change. 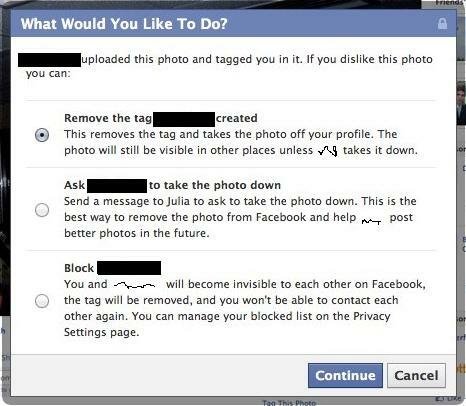 FB now lets you tag anyone outside your friends’ list with the screening power in the hands of the one whom you tag. The one (outside your circle) whom you tag is now powered to control the tag and to manage the future activities in three formats – Remove the tag, Ask you to take that particular photo down and Block you. Hopefully, Google+ learning from Facebook will also apply such photo and post tagging control options in near future when it launches officially. Google+ is still under beta testing. These 3 lessons are NOT the only and limited lessons that Facebook has learnt from Google+ and applied accordingly into their interfaces, rather there are many more. It is always a neck-tight competition among these two rivals though they officially never declare so. If you ever come across something that either FB is learning/ imitating from G+ or vice versa, you may add that as a comment to this post. Let’s harness the beauty of learning from each other as Google+ and Facebook are doing.